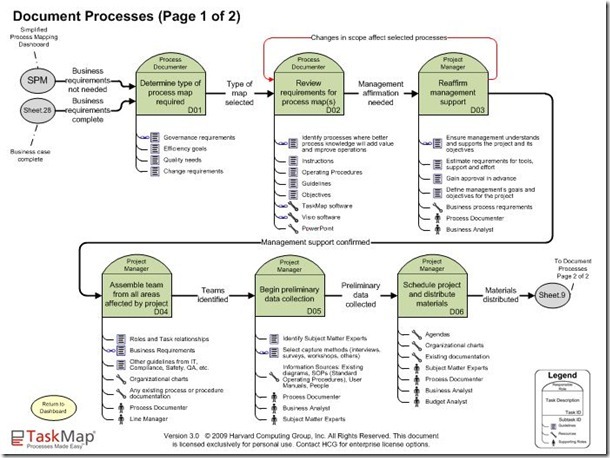 The Simplified Process Mapping RoadMap provides a framework for all aspects of documenting and improving processes. By documenting these processes tremendous savings can be made in time and energy. Click on image to download process flow. When business justification is not required or when the business requirements complete the ‘Document Processes’ process begins. The first Task in the Document Processes process has the Process Documenter determining the type of process map required. Possible types include: Governance, Efficiency, Quality, and Change. Once the type of map is selected the Process Documenter review the requirements for the process map (or maps). Identify processes where better process knowledge will add value and improve operations. During this requirements review instructions, operating procedures, guidelines, and objectives are all taken into consideration. Once the requirements for the process map(s) have been reviewed, stakeholder information is needed to reaffirm Management support for the project. The Project Manager reaffirms Management support by ensuring Management understand and supports the project and its objectives.